6. ¿Y Tú Qué Has Hecho? This album brought Cuban music to the forefront of the World Music scene and actually topped the charts in many countries with it's infectious but also supremely composed and played music. Often on this list, when it comes to "world music", I disagree with the choices of the authors who seem to frequently reveal a lot of ignorance about the music of the countries they are picking. 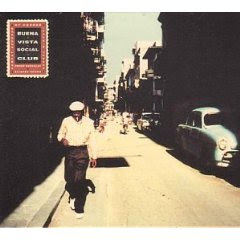 Buena Vista Social Club, in spite of being such a hit album, is not one of those cases. This album deserves all the praise heaped on it. Each track is an amazing work, there is not a single less great track here, fortunately Ry Cooder does not seem to have tried to make the music more appealing to Anglo audiences by adding extraneous instruments or arrangements, so it sounds authentic and the quality of the production is such that you hear each single instrument clearly while keeping a certain intimate feeling. Amazing. In 1996, American guitarist Ry Cooder had been invited to Havana by British world music producer Nick Gold of World Circuit Records to record a session where two African High-life musicians from Mali were to collaborate with Cuban musicians. On Cooder's arrival (via Mexico to avoid the ongoing U.S. trade and travel embargo against Cuba), it transpired that the musicians from Africa had not received their visas and were unable to travel to Havana. Cooder and Gold changed their plans and decided to record an album of Cuban son music with local musicians. Already on board the African collaboration project were Cuban musicians including bassist Orlando "Cachaito" López, guitarist Eliades Ochoa and musical director Juan de Marcos González, who had himself been organizing a similar project for the Afro-Cuban All Stars. A search for additional musicians led the team to singer Manuel "Puntillita" Licea, pianist Rubén González and octogenarian singer Compay Segundo, who all agreed to record for the project.